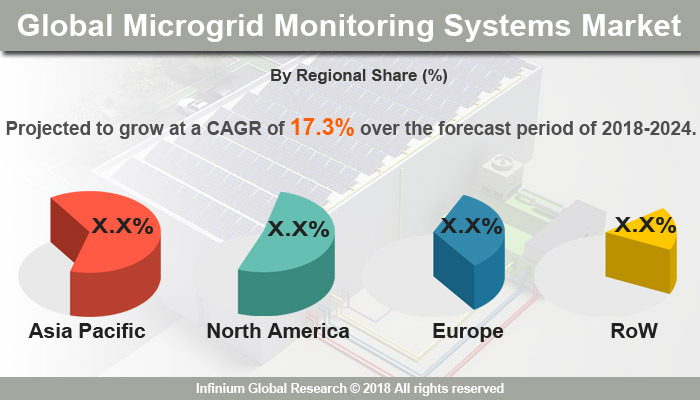 A recent report published by Infinium Global Research on microgrid monitoring systems market provides in-depth analysis of segments and sub-segments in global as well as regional microgrid monitoring systems market. The study also highlights the impact of drivers, restraints, and macro indicators on the global and regional microgrid monitoring systems market over the short term as well as long term. The report is a comprehensive presentation of trends, forecast and dollar values of global microgrid monitoring systems market. According to the report, the global microgrid monitoring systems market is projected to grow at a CAGR of 17.3% over the forecast period of 2018-2024. Maintains of the power grid for the reliable and stable operation of the power grid is a critical task. In order to monitor and manage the real-time operations of the grid, the Microgrid monitoring systems are used. A microgrid is a group of interconnected loads and distributed energy resources that can connect and disconnect from the grid to enable it to operate in both grid-connected or island-mode. This system contains grid contains modular instrument systems and the industrial computer along with the various hardware and software’s to keep the real-time update. Microgrid monitoring systems include a wide range of products that are standardized, engineered, and configured with essential auxiliary equipment. Growing demand for electricity generation through renewable energy sources across the world and increased installation of grids has driven the growth for the microgrid monitoring systems market. Hence these factors are anticipated to drive the microgrid monitoring systems market. Besides this, developing economies are projected to present considerable opportunities for this market as they are extensively increasing their focus on renewable energy. On the flip side, the high installation cost of these systems hampers the growth opportunities in the underdeveloped countries which in turn, may hamper the market growth especially for small-scale industries with inadequate capital. Among the geographies, Asia Pacific is the largest and the fastest growing region in the microgrid monitoring systems market. Increased demand for electricity owing to the increasing electricity consumption, rapid urbanization and growing population is driving the microgrid monitoring system market in the Asia Pacific. In addition to this, consciousness regarding energy conservation and the need for providing a continuous supply of electricity to people are also some of the major factor boosting the market growth for the same. The report on global microgrid monitoring systems market covers segments such as product and application. On the basis of product, the global microgrid monitoring systems market is categorized into hardware systems and software systems. On the basis of application, the global microgrid monitoring systems market is categorized into commercial uses, military, and campus. The report provides regional analysis covering geographies such as North America, Europe, Asia-Pacific, and Rest of the World. In this section, the key trends and market size for each geography are provided over the period of 2016-2024. The countries covered in the North America region include the U.S., Canada, and Mexico; while the Asia-Pacific region includes countries such as China, Japan, India, South Korea, Malaysia, and among others. Moreover, Germany, U.K., France, Spain, and Rest of Europe are the major markets included in the European region. The U.S. drives the growth in the North America region, as it is the largest market in the region. In the Asia-pacific region, rapid industrial growth in India and China offer a substantial potential for the growth in the microgrid monitoring systems market. As a result, the APAC region is projected to experience a growth at a CAGR of x.x% over the forecast period 2018-2024. The report provides profiles of the companies in the global microgrid monitoring systems markets such as ABB, Eaton Corporation, General Electric, Siemens AG, Caterpillar, S&C Electric Company, Power Analytics Corporation, Schneider Electric, Exelon Corporation, and Homer Energy LLC. The report provides deep insights into the demand forecasts, market trends, and micro and macro indicators. In addition, this report provides insights into the factors that are driving and restraining the global microgrid monitoring systems market. Moreover, The IGR-Growth Matrix analysis given in the report brings an insight into the investment areas that existing or new market players can consider. The report provides insights into the market using analytical tools such as Porter's five forces analysis and DRO analysis of microgrid monitoring systems market. Moreover, the study highlights current market trends and provides forecast from 2018-2024. We also have highlighted future trends in the microgrid monitoring systems market that will affect the demand during the forecast period. Moreover, the competitive analysis given in each regional market brings an insight into the market share of the leading players. This report will help manufacturers, suppliers, and distributors of the microgrid monitoring systems market to understand the present and future trends in this market and formulate their strategies accordingly.